At audio shows, anytime I’ve run into Michael Vamos, the president of Audio Skies and importer of Larsen loudspeakers, he seems to be in an exceptionally good mood. Maybe he’s on medication. Maybe he’s just been to the hotel bar. Maybe he’s just constitutionally happy. Or perhaps it’s because, unlike most of his fellow exhibitors, he’s had a relatively easy time setting up an audio system in the notoriously challenging acoustic environment of a hotel room. 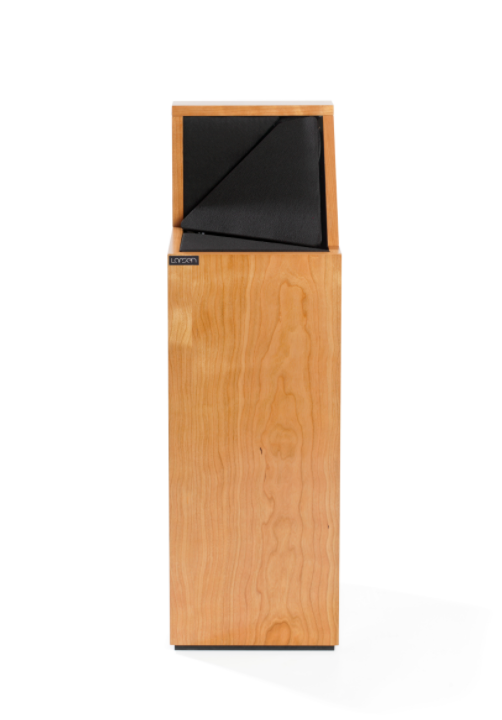 Like all of the Swedish company’s speakers, the Larsen 6.2 is designed to be placed against the wall the listener faces, directed straight ahead. Moreover, this means two often-vexing set-up variables have been eliminated: how far out into the room to situate the speaker, and the degree of toe-in needed. When a pair of 6.2s arrived for review this winter, I left the sofa that I listen from in its usual location and plunked the speakers down against the front wall where they looked right. In my 225-square-foot space, they were about 9' apart center-to-center and 10' from my ears. Tonal neutrality and imaging were exemplary from the get-go, and I didn’t fuss at all with the Larsens’ position for the entire review period. Easy peasy. The Larsen 6.2, $3995 per pair, isn’t going to win any beauty contests. On the other hand, they don’t call attention to themselves, and the requirement that they be situated against a wall is likely to please a non-audiophile domestic partner. The 6.2’s footprint is only 9 ¼" x 10 ½" and the speaker is a mere 30" tall when placed on the foam pads that the manufacturer provides to couple the Larsen to whatever sort of surface it rests on. The enclosure is fabricated from sturdy MDF and covered with a wood veneer—options include mahogany, cherry, maple, and white or black lacquer. In the high-end loudspeaker world, hernia-inducing mass is an attribute that, rightly or not, has come to garner respect. In this context, the Larsen 6.2 is almost comically lightweight at 30 pounds. Once, when switching amplifiers, I pulled too hard on the cable connected to one speaker and the little guy fell over. The top portion of the 6.2 and other Larsen models is an odd-looking affair. The speaker’s two drivers are seated in an MDF baffle that tilts back and angles inward toward the listening position (as seen in the photo). Those two drivers, both sourced from Scan-Speak, are a 1" low-mass textile soft-dome tweeter and a 7" carbon fiber mid/woofer cone that’s coated with air-dried pulp. A semi-circle of felt surrounds both the tweeter and the empty real estate medial to the driver baffle, and on the horizontal shelf below it is fitted with triangular pieces of fabric-covered absorptive material. A grille cover of black fabric stretched over a metal frame is held in place by three pins; I left it on for listening. The backwave of the mid/woofer is conducted into the 22-liter box, which is vented to the rear. The 6.2’s crossover, characterized as combination second and third order, is built with large, air-wound copper coils, polypropylene SCR capacitors, and non-magnetic connectors. I began listening to the Larsen 6.2s with a pair of Pass Labs XA60.8 monoblocks and, as noted below, two more powerful amplifiers saw service as well. The rear panel of the Larsen sports two pairs of five-way binding posts, and I never refuse a chance to try bi-wiring. For most of my time with the Larsens, I employed a six-foot pair of the latest Anti-Cable bi-wires (at $200/pair, still among the most exceptional values in speaker cable out there) but also used my usual Transparent Generation 5 Ultras, with robust Transparent jumpers replacing Larsen’s standard jumper bars, one of which was missing from the well-travelled review pair of 6.2s. Source material was all digital: I played HD files with a Baetis Reference 2 media computer, either directly into my Anthem D2v pre/pro or via a T+A DAC 8 DSD, and polycarbonate discs using an Oppo BDP-93 as a transport. So that’s the theory. How does it work in practice?